Avoiding vendor lock in and ensuring ownership of digital assets are two hurdles that InMotion Hosting is helping businesses overcome with the launch of its new website builder. 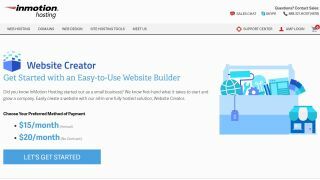 The firm's latest product, Website Creator, is the first WordPress compatible all-in-one website builder solution that enables businesses to easily create and manage a commercial online presence while still retaining ownership and control of their functional website assets. Website Creator goes beyond simplifying the task of creating a professional quality site by taking full advantage of WordPress' ecosystem. By leveraging WordPress and Boldgrid's suite of advanced site creation and management plugins, InMotion Hosting's new product streamlines the web design process with a built-in drag-and-drop website builder. Website Creator goes a step further by allowing businesses to automate their social media posts and a real-time SEO tool ensures that their page will be ranked higher than with competing offerings. InMotion Hosting's customers will even be able to extend and automate the functionality of their website with thousands of WordPress plugins while being able to seek additional expertise from WordPress professionals online. InMotion Hosting is currently number one on our list of the best web hosting services and the company is able to service individuals and businesses of all sizes looking for WordPress or ecommerce hosting.